After the fall of the Berlin Wall, many Americans seem to have forgotten that just 90 miles south of Florida is a communist gulag that continues to persecute its people. Every year, thousands of Cubans brave the open sea on makeshift rafts trying to make it to Florida, risking their lives rather than remain in the “workers paradise.” Most of them either drown or, due to a change in policy under the Clinton administration, are picked up by the Coast Guard and promptly sent back. For many Cubans, the memory of 7-year-old Elian Gonzalez’s miraculous rescue and traumatic return to Cuba in 2000 is still fresh. 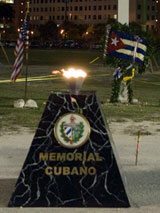 Every year in February, the Cuban exile community of South Florida commemorates the more than 100,000 victims of the communist regime of Fidel Castro with a ceremony called Memorial Cubano. The three-day event attracts several thousand people, many of them relatives of those killed, for prayer and remembrance of the dead and the 11 million Cubans still languishing on that island prison. Four members of the American TFP, Gerald Richards, Michael Gorre, James Bascom, and John Miller participated in this year’s Memorial Cubano held on February 15-17 at Tamiami Park at Florida International University in Miami. Upon arriving at the park, one is awestruck by the sight of more than 10,000 white crosses neatly arranged on the main field, each representing a victim of Fidel Castro. All of them have the victim’s name and the place and date where he or she was murdered. Many crosses have flowers or a photo of the person left by their family. Although by no means complete, the huge field of crosses nevertheless serves as a powerful symbol of the scourge of communism in Cuba. Arriving at the park, one is awestruck by the sight of more than 10,000 white crosses on the main field, each representing a victim of Fidel Castro. The TFP delegation, dressed in ceremonial habit, brought a large statue of Our Lady of Fatima to preside over the Saturday evening event. After several prayers, readings from the Gospel, and speeches of local Cuban leaders and relatives of the victims, Michael Gorre played taps, followed by Gerald Richards playing Amazing Grace and Highland Cathedral on the bagpipes. The event closed with the singing of the Star Spangled Banner and La Bayamesa, the Cuban national anthem. The recent “resignation” of dictator Fidel Castro has brought Cuba back to the forefront of discussion in the United States. Although Castro may be slowly fading from the picture, the communist regime remains firmly in place. May the Virgin of Caridad del Cobre, patroness of Cuba, liberate that nation from its more than 50 years of suffering under the communist yoke and bring those responsible for it to justice. Related article: Cuba: Submarine of the Left. 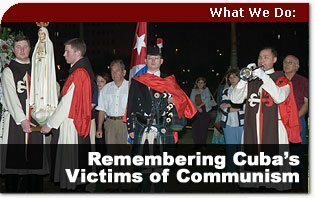 This entry was posted in Events of 2008, News Commentary and tagged 2008, Castro, Communism, Cuba, dictator, Fidel Castro, island, prison, remember, remember the victims., victim by TFP.org. Bookmark the permalink.